bumkins: Break Out the Baby Bottle, We Won a Cribsie! 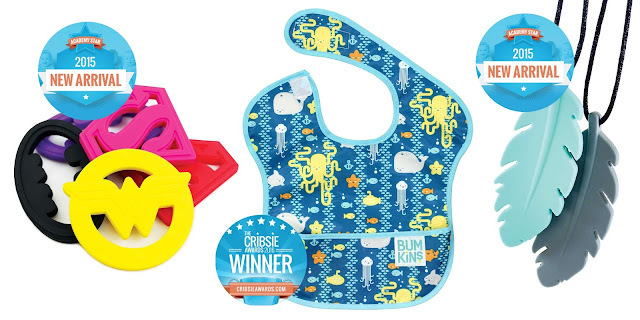 We couldn’t be any happier to announce that the SuperBib has won another Cribsie Award! Thanks to you, our loyal fans and voters, we were named “The Surest Way to Save an Outfit” in the Mealtime category. This is the THIRD year we’ve brought home this coveted award and we’re happy to keep doing so, if you’ll have us. The winning doesn’t stop there! Two of our newer products, the Nixi SiliconeFeather Teething Pendant and the DC Comics by Bumkins Silicone Teethers were both deemed Academy Stars in the 2015 Cribsie New Arrivals section. We can’t thank you enough for all the love. We have the greatest fans around!